Watermarking is apparently an essential aspect for all online digital media ventures. It is a must-have among photography studios, film production companies, music studios, publishers and even official bodies like the government to claim ownership of media that's sourced by them, on and on the Internet. Embedding a watermark onto your digital images, videos, sound files and PDF's may not only be a stringent check upon unfair possession of the material, in the manner that they cannot be effaced without distorting the media but also ensures they are attributed to you, their original creator while making you look professional and responsible as well. One can put the relevant information, signatures, trademarks or logos as a watermark, that could serve as the primary identification of your brand. Some software even allow digital watermarking for covert purposes, thus helping to track hotspots of online fraud. 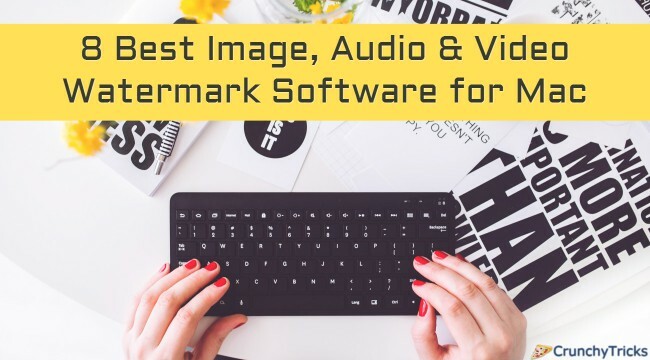 Several kinds of watermarking software are available, both free and for a price, that should do the job efficiently to help you establish your signature over your media as a token of trust and dependability. Here, at CrunchyTricks, we'd be talking about ten such apps for Mac that'd provide for all your watermarking methods. Star provides watermark software both for graphic and PDF files, for Windows and Mac. Many remarkable features define Star Watermark- The output preview enables you to determine how'd your watermark look on the space finally and it supports multiple languages like English, Portuguese and Japanese, apart from providing increased customization features such as rotation, transparency, text color, size and others. All these tools are by default in batch processing mode so you may apply your watermark to multiple images and documents simultaneously. The interface is consistent for both platforms for easy interchangeability. All these features promote saving time and resources and have earned quite a few accolades for genuineness. The Star Watermark for Mac costs around $18.99 and the PDF watermarking version costs about $29.50, promising perks such as lifetime free updates and 24x7 customer support. You can download a trial version for free with enough features to enjoy the software, though. iWaterMark Pro is a great choice if you expect excellent compatibility with a watermarking software. It works on all iPhone, Android, Windows and Mac devices and more interestingly on all camera devices, including smart-phones and DSLR. Along with text and graphic data, you can also inscribe metadata, QR code and stenographic digital watermarking, thus making images serve as hyperlinks and information cards. Basic artistic features are present in this software, such as resizing, rotation, transparency, text size and color. If you want zing on your label, you can also apply special effects to embellish your watermarks. The position can be precisely determined by pixel numbers (absolute orientation) or according to image dimensions (relative orientation) if you are working with photographs of different sizes. Watermarks may be localized for many languages, and you can backup, export and share your watermarks in watermark cloud. You may browse for watermarks on Adobe Lightroom, iPhoto and Aperture if you run out of ideas to create your own. It also lets you work with fast parallel processing technique. So watermark with iWaterMark Pro and avoid all the hassles of litigations and squabbles. You can purchase it for $30.00. With a primary focus on batch watermarking, Visual Watermark entices all prospective professionals with noticeable features- As it is a desktop software, optimum performance is ensured, using all processor cores available, up to quad-core, thus being quick and responsible under high load. At times of confusion, use the Auto-resize feature to bring multiple differently sized images in perfect alignment with each other. It comes with 260 fonts, 66 effects and 100 transparency levels that urge you create your distinguishable watermark. The logo and text can be relatively aligned and sized in any combination. For amateurs, who haven't figured out what their signature would look like, Visual Watermark provides 12 primitive watermark templates. Choose one that suits your style, change its size, transparency and position, put in a logo of your preference, add your brand name and that's it! You are a professional already! The quality isn't compromised when you overlap your watermark as it maintains best possible colors by not using chroma sub-sampling while saving in JPEG and supports all color palettes such as RGB and CMYK. Among the Basic, Plus and Premium versions, Plus is most popular, for $29.95. uMark should render you a comfortable watermarking experience, with a live preview of your alterations on the image, providing borders and shadows to highlight your images, creating and saving watermarks on the spot and watermark tilling to cover your photograph with watermarks (if that doesn't depreciate the beauty of the picture). It supports multiple platforms and eight languages including English, Turkish and Dutch. A separate version which focuses on video watermarking can convert videos from one format to another, resize or compress videos to the desired size along with watermarking multiple videos at once. The full version is available for $29.00. But you can download an inferior free-trial version. Well that's a straightforward name for its functionality, isn't it? With Video Watermark, you can add text, image and animated GIF logos to your video. You are permitted to choose from a library of around a hundred watermarks. Work with loads of videos together with batch processing. Control the period and animation from Timeline, employing unique effects and myriad editing functions this software is made to offer you. Sheer convenience and efficiency are available for free download. The paid version, Video Watermark Pro, with extended features, will cost you around $34.95. It comes with 30-day money-back guarantee. This is a discounted price, only for a limited time. So hurry! Brand your videos with your distinctive watermarks with Wonder Video Watermarks, at your service with diverse converting and editing features and assuring zero quality loss. The burden of the watermarking process becomes ethereal when you have more than 150 watermark components to choose from and the Timeline to control your watermark. It supports text and images watermarking so that you may apply your designed watermark easily. It is downloadable for free, although you may make space in your cart for a professional version that'd cost you around 39.95$. Also, comes with 30-day money-back guarantee. Peak Pro 7 shows compatibility with Leopard and Snow Leopard versions of Mac. It comes with excellent features like audio editing, mastering, podcasting, sound design, audio restoration and various others, making it a preferred choice among all music professionals and sound engineers. With its fantastic sound quality and precision, it gives you an exceptional service. Peak is ideal for batch watermarking of audio files, providing noise-reduction where the sound signal is inserted. You may even copy the watermark and batch through the next files pasting it. It also reduces the disturbance in wave signals due to the juxtaposed watermark, making the audio signal seem inherent. Peak is unanimously the most powerful audio editing tool for Mac. It is outrageously overrated, and is highly expensive, costing around $600. But you can download a free 14-day trial from the website if you are okay with the fact that you can only record 5 minutes of audio, with disabled save and batch processing. AG Audio Watermark is another reliable software for batch processing audio watermarks. You can add multiple audio files to serve as watermark and decide upon their offset and repetition interval. You may even adjust the sound quality, the folder for the output and all the files in the batch to be saved as individual files or a single merged file preserving the integrity of each file involved. Compatible with Mac OS X. You may download it from the website at a price of $10.00.